Warning: All pilots should be aware that a top landing at this site is always necessary. If you are not qualified or current in top landings you should take advice from a local club member or coach before flying. Pilot Level: CP+ 20 Hours + Local Knowledge. Must be competent at slope landings. Site Description: A cliff site with ABSOLUTELY NO BOTTOM LANDING. Beware – Perranporth airfield begins just to the right of launch (i.e. towards St Agnes village); all pilots must ensure that they contact Perranporth ATC before flying. All pilots must also ensure that they do not fly in the NO FLY ZONE as marked in red on the map below. How to get there: Approaching St. Agnes from the A30 turn left at the mini roundabout. Continue straight on along the narrow winding road. The “main” road bears left where Chapel Porth Beach is sign posted. Keep on the “main” road. Turn left down a lane toward the sea. There is a height barrier which may be a problem for vans with roof loads. At the T junction turn right into a parking area. Vehicle Access & Parking: There is an obvious parking area. Please leave room for cars to enter and exit. Rules and Restrictions: If unfamiliar with the site seek advice from local pilots before flying. 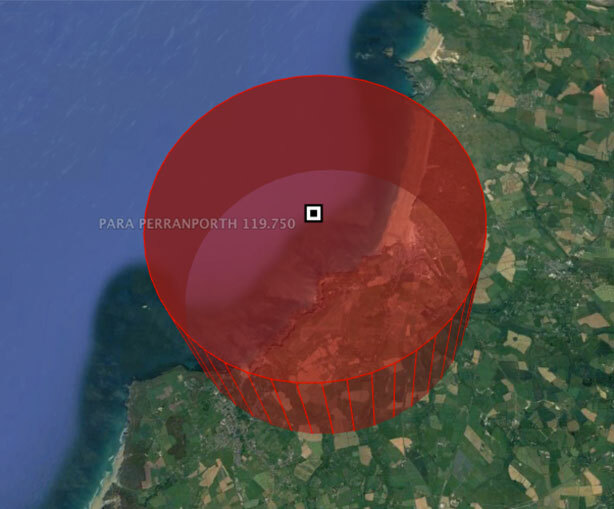 Clear flying with Perranporth airfield before flying and do not fly in the NO FLY ZONE as marked in red on the map above. Perranporth Airfield: 01872 552266 (flying club) or 01872 552856 (café) try both numbers. The site is much used by radio controlled model glider fliers, so please liaise with the modellers. 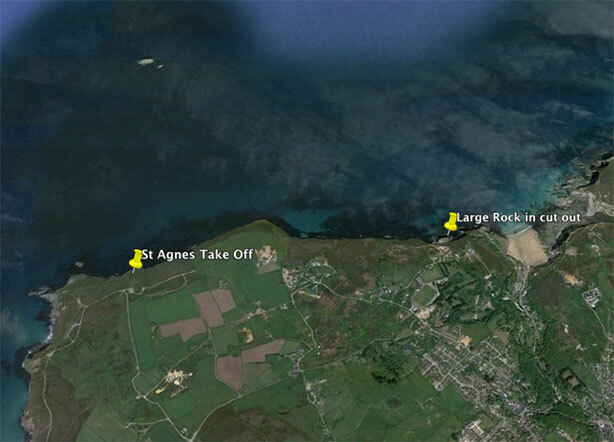 Also not the club’s long standing local agreement with the airfield, that we limit our flying from St. Agnes as far as the large rock just before Trevaunance Cove; as indicated on the image below. Rigging Notes: It is a very short carry from the car park to the rigging area. Launch Notes: Be 120% certain of lift before launching. If in doubt – don’t. Top Landing Notes: Land in the huge area behind and to the west of launch. Land well back. Do not overshoot. Bottom Landing Notes: Not at all applicable, sea – never any beach! Hazards: The obvious hazard of flying a site with absolutely no bottom landing and flying with radio controlled aeromodellers. The NCI Station west of launch is used by radio hams who have a CAA license to fly a kite aerial up to 600 feet. Airspace: This site is in a Military Low Flying Area. Be aware of Perranporth Airfield and it’s ATZ. If you are likely to fly inland clear your flying with Perranporth Airfield on: 01872 552266 (flying club) or 01872 552856 (café) try both numbers. XC Tips: Look out for the RNAS Culdrose MATZ and ATZ downwind.